And a 350v63, fireglo, on the truck for delivery. The 660/12 in Monte, what a stunner that must be . I wish Monte appeared more often. Hello, I thought I had an account several years ago, but it seems to be gone. 1 4003FL BB 2007 yes, just got it. I'm new to the forum and just bought my 1st Ric on December 30th and been playing bass for 33 years. I own two RICS and I bought my son one for a graduation present. I purchased all 3 at an excellent RIC dealer in Chicago, IL called Chicago music exchange. I've actually only been playing guitar for only two years now, but I've been playing bass since I was 18 years old. 4003 bass - FG purchased brand spanking new in February of 2009. 330/6 - FG purchased brand spanking new in 2010. Not sure of the month. I bought my sons 360/6 - FG brand spanking new on the same day and place I bought my 4003. I'm a 39 year old male, Widower, and I currently reside in the sticks in northern Indiana. About a 2 hour drive from Chicago. 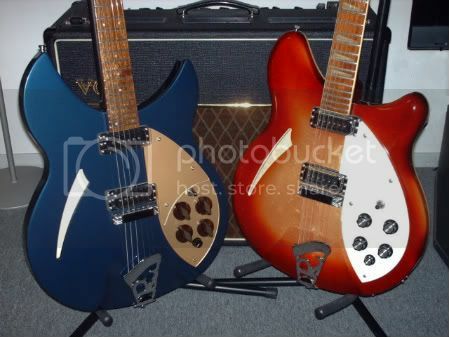 Yeah, I now am a member of the "More Than One Rickenbacker" club. My wallet is happy that I really do not see any more Rickenbackers in my future. However, I would immediately buy a short scale non-Lennon 325 if it were produced. 2008 330/12 MG and a 2011 4003 JG. Am looking for the next one to add to the (growing collection).